I’ve said it before, I’ll say it again…I have met some truly amazing people thanks to blogging. Amazing. People. One of those people is food blogger and cookbook author Kathy Strahs. We met many moons ago at a conference and our friendship grew from there. For a short time we even lived in the same neighborhood, which was the BEST THING EVER. Sadly she’s not down the street any more, but I make up for that by pestering her with text messages. One of the things I love about Kathy so much is her brain. She is a smart cookie, that Kathy. She also happens to be good at making cookies. She’s the whole cookie package (that’s like the highest compliment I can give someone). Anyway, yeah, Kathy’s brain. It does smart and cool and high quality stuff. So, why am I rambling on and on about Kathy? Because I have some of that awesome Kathy stuff to share with you! Today Kathy launched a Kickstarter for her next cookbook The 8×8 Cookbook: Square Meals for Weeknight Family Dinners, Desserts and More along with her new publishing company Burnt Cheese Press. Here’s the deal. You will love this book. You need to buy it. Visit Kathy’s Kickstarter page to see the different pledge levels and secure your first-edition copy today! The pledge rewards are great, including a “How to Make Mac ‘n Cheese” graphic t-shirt designed by Kathy’s adorable daughter Hayley. There is a book trailer on the Kickstarter page as well as more details about the project. Please check it out and spread the word! To celebrate today’s launch, I am participating in a blog potluck with Kathy and other food friends! 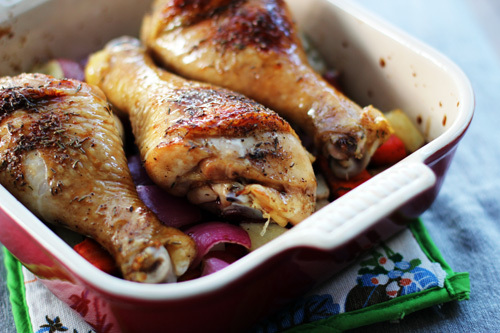 I had the chance to make one of her 8×8 recipes – Honey-Glazed Chicken with Root Vegetables. Prep time was less than 25 minutes and dinner was delicious. I even doubled the recipe and used TWO 8×8 pans, because I knew we’d love it so much. I was right, we did! A potluck wouldn’t be a potluck with just ONE dish! 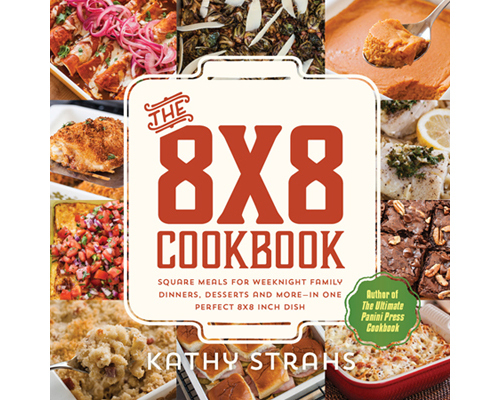 Be sure to check out all the other recipes from The 8×8 Cookbook that are being featured today to celebrate Kathy’s Kickstarter launch! 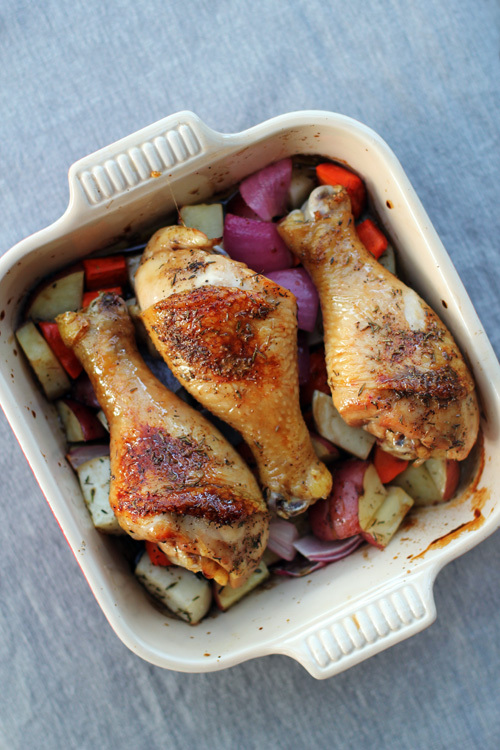 Without further ado, Honey-Glazed Chicken with Root Vegetables! By Kathy Strahs, from The 8x8 Cookbook: Square Meals for Weeknight Family Dinners and More--In One Perfect 8x8 Inch Dish (Burnt Cheese Press, 2015), reprinted with permission. 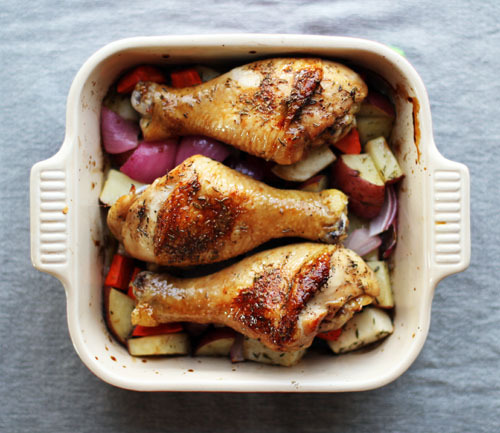 As excerpted from the book: "The shiny glazed chicken drumsticks get all the attention in this dish, but the roasted root vegetables relaxing beneath them really deserve some notice. Carrots, turnips, and potatoes are flavorful in their own right, and here, with honey-balsamic glaze traveling down from the chicken, they become truly next level! 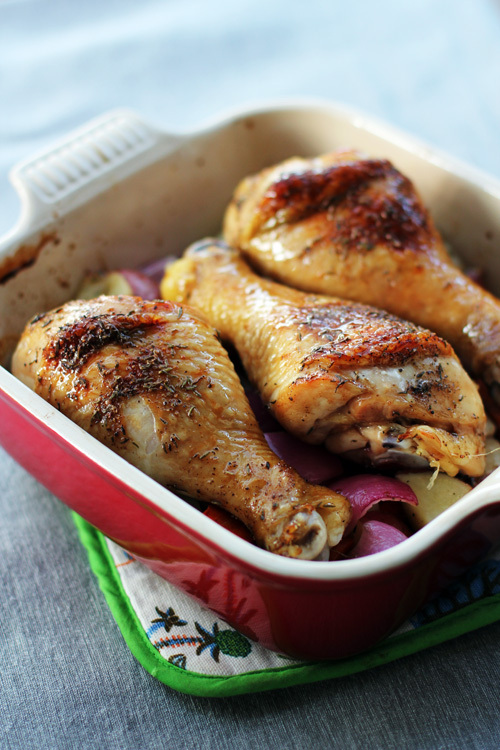 They go into the oven partially cooked to make sure they’re done right in synch with the chicken." Place the carrots, turnips and potatoes in a microwave-safe bowl, cover with plastic wrap, and microwave on high for 4 minutes (alternatively, you can blanch the vegetables in a large pot of boiling water for 3 minutes). Drain any excess water and transfer the vegetables to an 8x8-inch glass or ceramic baking dish or metal baking pan. Add the onion wedges to the dish or pan. In a small bowl, stir together the honey and balsamic vinegar. Set aside. In a small bowl, combine the thyme, salt and pepper. Measure out ¾ teaspoon of the seasoning mixture and sprinkle it all over the vegetables. Drizzle olive oil over the vegetables and toss to combine. Season the chicken with the remaining seasoning mixture–be sure to slide some of the seasonings under the skin as well as on the outside. Arrange the chicken on top of the vegetables. Roast for 20 minutes. Brush the chicken with half of the honey-balsamic mixture and bake for another 15 minutes. Brush the chicken with the remaining honey-balsamic mixture and continue baking until the chicken reaches an internal temperature of 165ºF and the vegetables are tender, about 10 minutes more (tent the chicken with foil if the glaze starts to burn). Thank you to Le Creuset for providing the beautiful 8×8 dish! You are seriously the best, Jane! The next time I’m feeling down, I will definitely re-read this post. 🙂 Thank you so much for all of your kind words and your incredible friendship and support! Congrats to Kathy and wishing her nothing but success! I love the sound of her new cookbook!!! I’m late to the party by a few years, but I just made this last weekend, and it was fantastic! The vegetables came out so sweet, and the chicken reminded me of Thanksgiving!